- Digital Temperature controller helps to adjust temperature easily. - Cooling and freezing System bring efficiency to the kitchen. 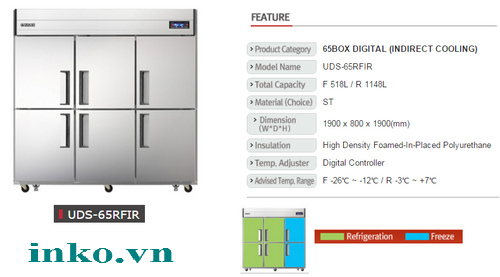 Specially designed with 2 freezing drawer and 4 cooling drawer help to keep fresh all foods like meats and seafood, as well as vegetables & fruits.Cooling Freezer helps to save space for kitchen in restaurants,because freezing drawer and cooling drawer are in the same device conveniently, especially for the small kitchen area.